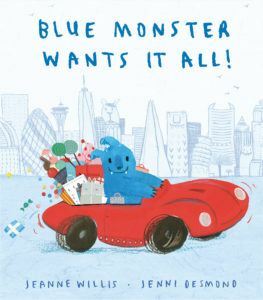 Readings and activities with Jeanne Willis – Bounce Sales & Marketing Ltd.
An original, humorous and unforgettable fable perfect for introducing little ones to the idea of materialism and helping them realise the importance of family. Blue Monster Wants It All! is ideal for primary school events and festival readings. Jeanne Willis is sure to entertain with readings, activities and signings.